This has been a frustrating weekend here at Knitigating Circumstances Headquarters. We have been trying very hard to post the first installment in RETROspective, a series featuring vintage garments handknitted by my mother and grandmother, and lovingly remodelled and rephotographed by three generations of us knitigating gals. I have the text all ready to go, but we have hit a technological wall. Emma is in Germany, which means she has no access to the thousands of photos we took for this series. Before she left, Doug uploaded all of the photos onto a cloud service so that she could access everything remotely. Unfortunately, Emma has very poor bandwidth, and way too many photos to sort through, so this solution isn’t working out. Yesterday, Emma and Doug had a two-hour long skype call trying to come up with a fix, and finally called it off. We are now attempting a second solution, using a semi-professional photo sharing site. I am doing an initial triage through the photos, narrowing them down to a hundred or so, and then we hope that Emma will be able to access them and apply her magic (oops, I meant skills) to get the right photos into the post. Our aim is to have a system that is optimized for our purposes, because once Emma is finished in Berlin she will be heading off to university and the future of our partnership depends on our being able to work together remotely. If any of you readers have any experience with these issues, and can offer us advice, please drop us a note. In the meantime, knitting progresses. If you recall, last Sunday I discovered a mistake in my Killybegs cardigan and had to rip the whole thing out and start over. 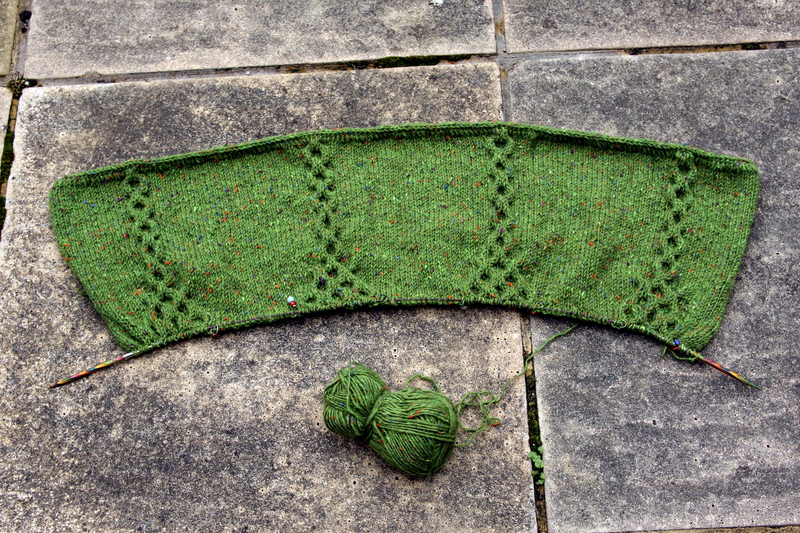 I have made great progress this week and have now got 10″ on the needles. 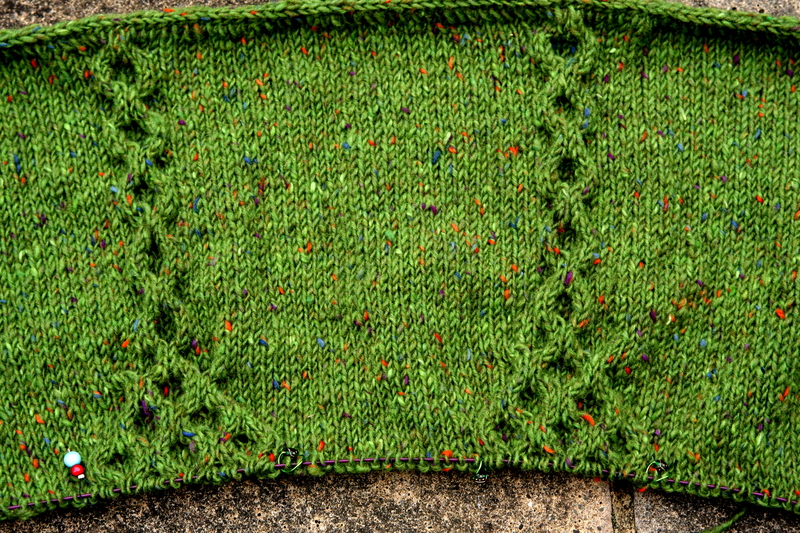 This is a lot of knitting, since the fronts and back are knit together in one piece. Laresca is designed by Corrina Ferguson and is available on the Twist Collective. If you haven’t checked out the Twist Collective, you really must. It is a webzine with amazing patterns and really good design and layout. Laresca is made with a Rowan yarn, Panama, that is a blend of rayon, cotton and linen. There is a nice lace panel that runs up the side of the top and then around the armholes. Panama comes in some nice colours and I went to the shop fully intending to make this in red, or perhaps purple or green, and completely surprised myself by buying the yarn in a neutral colour – I would describe it as oyster. 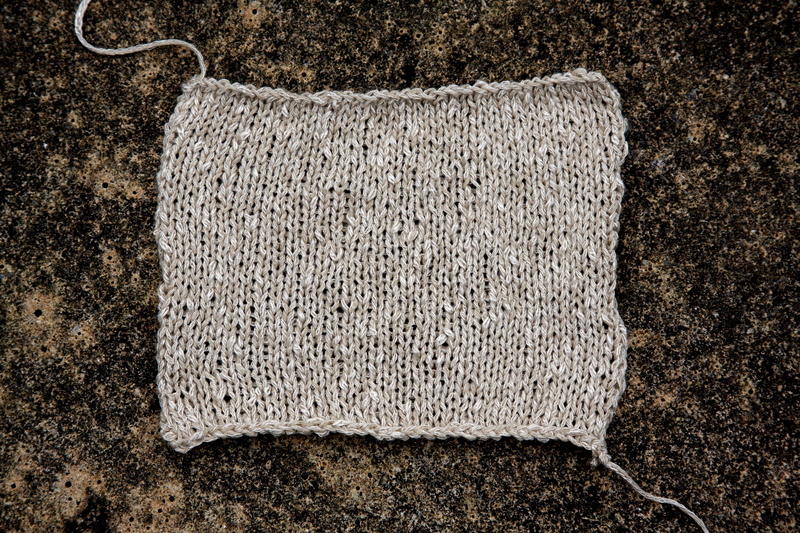 I have finished the swatch and hit the gauge right on first try. My plan is to knit the two simultaneuosly. 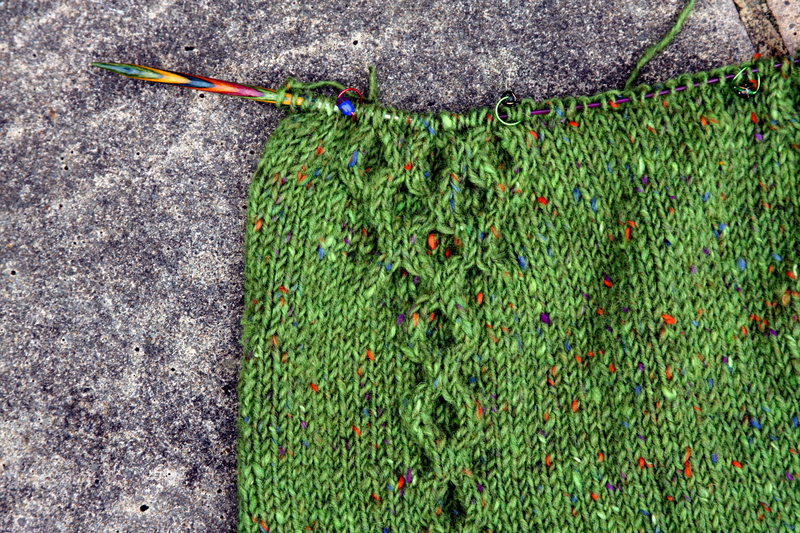 The thick wool and needles of the Killybegs are a little hard on my hands, so I hope to switch back and forth between the two projects. And if we ever get any summer weather, I may concentrate more on Laresca. Well, dear reader, that is all for today. Hopefully we will sort out our trials and tribulations and bring you RETROspective shortly. This entry was posted in Main and tagged Carol Feller, Corrina Ferguson, Killybegs, Knitting, Laresca, Rowan Panama, Twist Collective by knitigatingcircumstances. Bookmark the permalink. and i am sure emma can work her magic, she always does! Thanks, Romi. Yes, I rely on Emma to figure everything out. Mark says: From UBC Emma will have excellent bandwidth and the problem will go away. In the meantime, put the photos on a memory chip and mail them to her. Have you tried resizing the photos to a lower resolution, and uploading them to Flickr? This makes accessing the photos on a poor bandwidth more manageable. Hope Emma enjoys Berlin. I spent many summers there as a kid, with lots of fond memories. Still have lots of relatives there, but haven’t visited in well over 20 years. Where will Emma be studying? Your sweaters are divine. I love the tweed of the Killybegs, and I’ve yet to come across anything Rowan that doesn’t look fantastic. Hope your weather cooperates and that you can bash that Laresca off the needles and onto your back in no time. Thanks for the advice; we will hopefully sort this out soon. In the meantime, I think Emma is having too much fun in Berlin! We lived there for ten years while the girls were little, and really love it there. She is also enjoying speaking German again. As for me, I am enjoying some sunshine and working on Laresca. Ahhhh, glad to hear your up and knitting again, and that the sun finally came out. I’m bashing away on the R&Y and have high hopes for its completion. I imagine Emma is enjoying Berlin! At the age of 16, I was let loose in Germany for a year. Yes, it was a lot of fun, and I enjoy returning to Germany each year as time permits. Nothing like a good curry-wurst and Malzbier. saying, hello Kelly and this will be an excellent model for a blog I may write one day (after retirement)!